Over the past decade, the landscape of the commercial repair sector is changing: some smaller businesses are finding it tough to compete with superstores and large manufacturers, it can be difficult to affordably source spare parts or to reach new customers, and the next generation of younger repairers face an uncertain career path. While much of our work here at the Restart Project consists of community repair events, we see these as a way to highlight the need for a vibrant commercial repair sector. That is why we worked with the East London Waste Authority to conduct an investigation into the specific challenges faced by high street repair businesses and highlight those that are reliable. In a previous post, we introduced our research initiative and our three criteria for helping people identify reliable businesses: (1) having a local address (2) providing warranty for repairs (3) having good online reviews. This reduced our list of 152 businesses in East London to just 22. (You can see our full list here). “It’s a problem finding decent, honest people that know what they are doing”, said the owner of a high street family business. In part, this is due to the lack of training available for the younger repairers. And with the older generation set to retire soon, this is a problem that urgently needs to be addressed. “In our industry there are no training courses for repairing – you can’t do a degree in it. You can do electronics but that doesn’t tell you how to deal with the public”. But a large part of the problem is the lack of official accreditation that makes it easy for customers to connect with repairers whom they trust. Concerns were also raised about the increasingly poor quality of machines, the extortionate price of spare parts bought directly from the manufacturers, and the problems associated with building an online presence: people’s reliance on online reviews can be a double-edged sword. But they were optimistic that the current situation of high street repair businesses wouldn’t last. “People are sick and tired of the bad advice they are given, and the brick wall they hit if they have a problem because no one cares. It’s up to us to embrace that and keep hold of these people. I think people are looking to be treated as people again”. 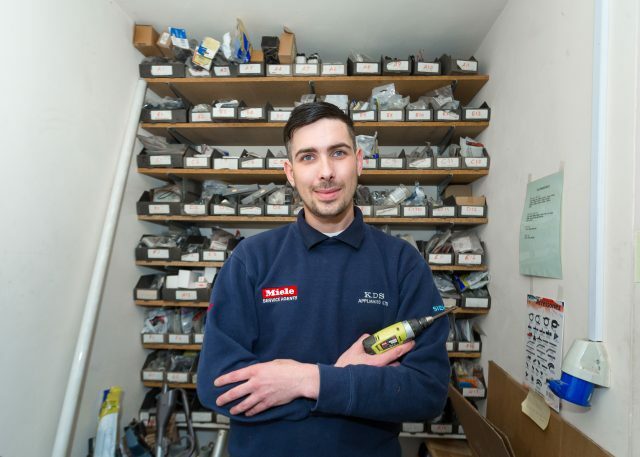 Ultimately, high street repair businesses have a lot of advantages over the manufacturers who have given up on building their customer-service reputations: they offer a service built on trust and ongoing relationships. What follows are the stories of ten of the 22 businesses mentioned above, those who agreed to have their portraits taken. The text was written by Keep Britain Tidy for the East London Waste Authority, and photos are by Brendan Foster. Our work to research and refer people to reliable repair businesses continues and will expand in 2018. Muhanad and Reh opened [email protected] six years. Reh looks after the phones and tablets and Muhanad takes on the computers and laptops. The two friends have a real love of fixing and enjoy spending their days repairing. It’s the first fixing business of its kind in Upminster and they have a whole list of regular customers. Who tell their friends. Who tell their friends. Who tell you. You’re welcome. [email protected] do not have a website but find them, and their great reviews, on Google. Dropped your iPhone in the sink again? Get yourself to Compushop. As a specialist in Apple Mac repairs and liquid damage (among lots of other fixing and software problems), Salim is your guy. He had a shop in the heart of the electronic fixing area on Tottenham Court Road for 12 years. Then three years ago he moved his business to Ilford and now helps east Londoners and their naughty gadgets. His interest started when he opened up a cassette tape recorder years ago. And that fascination never went away. “I have to discover what’s inside and how it works”. Who better to fix your console than a gamer? Kyle has been mending broken consoles since 2011 and knows better than anyone how to get you back in the game. One of his favourite things about the job is chatting with his customers and finding out what went happened (and yes, often it is spilled drinks). As a certified Apple IOS technician, he can mend your iPad and iPhone while he’s at it too. 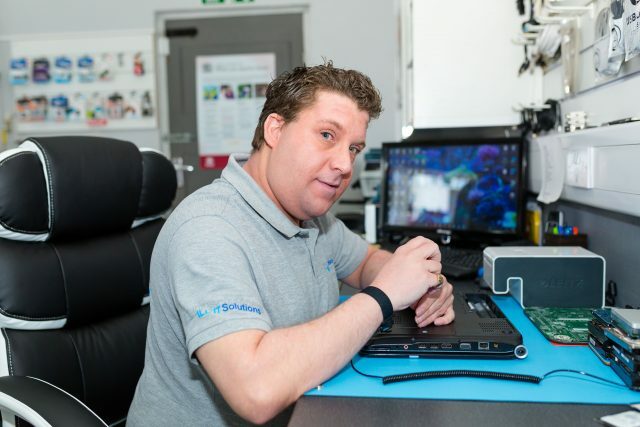 Kyle specialises in repairs, customisations, modifications and upgrades to your consoles, phones and tablets. And all work comes with a full standing warranty. Double win. John Wyatt set up Edwards Office Supplies in 1995 because he hated throwing stuff away. Seeing electrical items being binned rather than fixed really got on his nerves. 21 years later, he’s still helping people to fix rather than chuck. 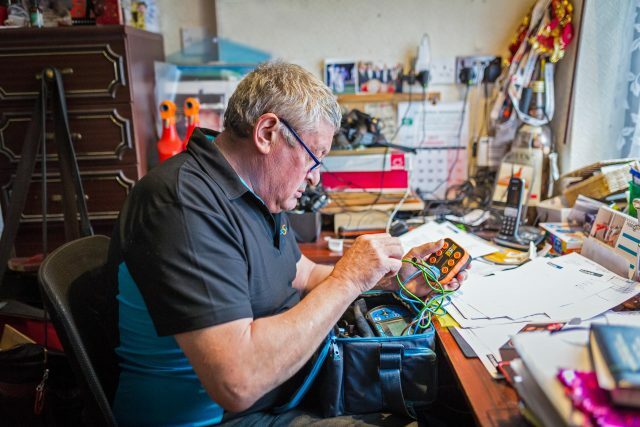 One of the fixers, Warren, has been tinkering with electronics since he was six years old. 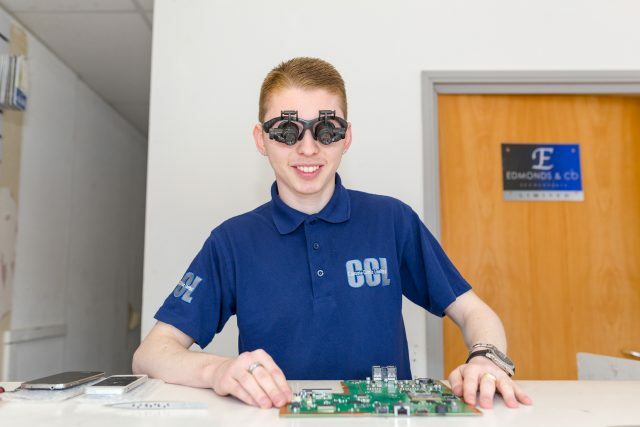 With a string of qualifications under his belt, and some high tech micro soldering equipment, he can fix your gadgets and explain to you exactly how he’s doing it. Steady hands are key but Warren loves the challenge of working out what’s wrong and putting it right. With a huge returning customer base, you know they’re doing something right. They repair computers, laptops, printers, photocopiers and games consoles. After building one of his schools first computers back in 1981, Paul Middleton has been constantly taking apart, putting together and fixing PCs and laptops ever since. He’s worked all over the world doing tech work for big banks and then in 2008 decided that he wanted to be his own boss. 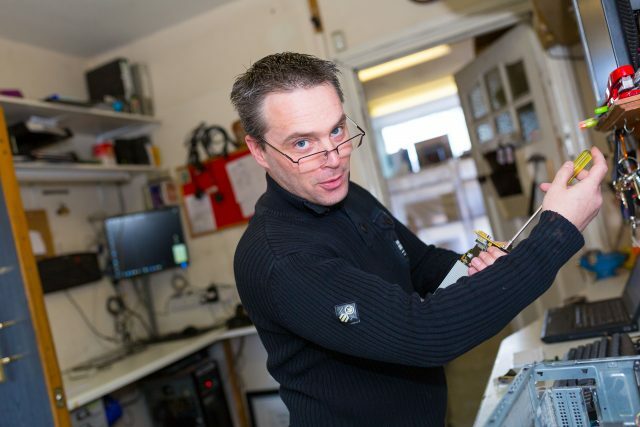 He set up Essex PC Fix nine years ago after his wife told him he may as well run his own business seeing as he’s always being stopped by neighbours asking him about their PC problems. As one of the happiest fixers you’ll ever meet, on top of 33 years experience, Paul is the man you’ll feel happy handing over your laptop to. For repairs and upgrades in the Hornchurch, Romford and surrounding areas – either in your home or collected and returned to you, get in touch with Paul. As one of 11 Gadcet shops, the Romford store is dedicated to fixing and selling repaired electronics. 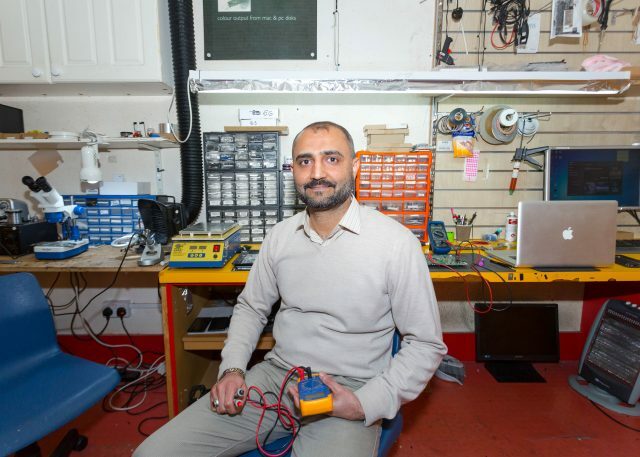 Ever since he was 10 year old, Abdul, one of the repairers, has been taking screws off anything he can get his hands on to find out what was inside and how it works. His personal philosophy is: there is nothing that can’t be fixed. 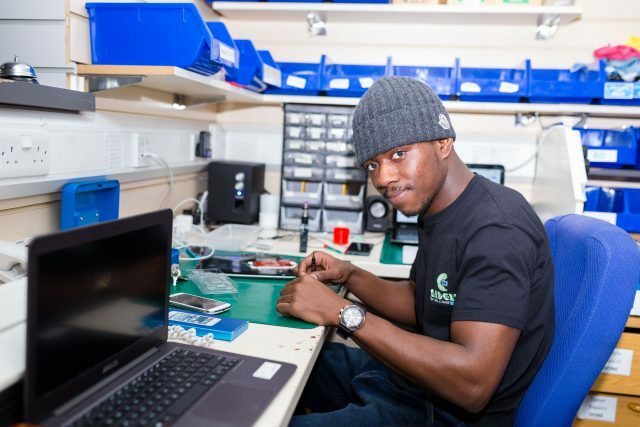 His colleague Leon studied a Diploma in IT at Havering College and loves finding out what’s gone wrong inside our phones and tablets. Apple items hold a special interest because they’re just that tiny bit more challenging to figure out. Challenging, but not impossible. Days after Lee’s parents bought their first computer, he took it apart. Luckily for everyone, he worked out how to put it back together again. Now, after a couple of qualifications and lots of experience, he gets paid to do the same thing. Lee started Ill IT solutions in 2008 after noticing the terrible customer service provided in bigger stores. For Lee, providing information and a friendly face are just as important as providing a fixed gadget. This family run business is all about service with a smile. The K in KDS stands for Kitchener. Which is perfectly suited to this white goods, family run business (yep, the Kitchener family). Now in its 50th year and handed down to the next generation, KDS has four fixers, racking up almost 70 years of experience between them. That’s a lot of white goods knowledge. They repair and service the kitchen equipment for most of the east London council offices, schools and care homes. And they can do the same for your home kitchen too! Richard James used to make award winning wine. But his real passion is fixing. When he was a kid he loved to take things apart and put them back together again. Now, as a qualified electrician with 44 years experience, a 100% exam result in his Electricians City and Guilds from Barking College and regular refresher courses to stay up to date with new regulations, he spends his days fixing electric goods for Romford residents. And he’ll even clean your oven too. Problems with the electronics and appliances are endemic, and industry is increasingly taking away our right to repair products, let alone making better products. We’re tired of the “take, make and dispose” economy, and there is a role for regulation. Enter Europe. Lucky for East Londoners. Is there any chance of there being a North London equivalent?